It stands to reason that stairways must be safe. If stairs are too steep, and they don’t have railings, or if screens and balustrades are not strong and secure, people may fall with disastrous consequences. What this means is that stairways, in addition to all the elements relating to them, must be properly designed. This takes us back to Part B of the NBR, which deals with structural design. Like everything else, stairways must be designed to provide the strength, stability, serviceability and durability required for use. It is imperative that they are built so that any accidental overload won’t cause the stairway to collapse. It is also vital to takes steps to ensure that people won’t fall off the structure. If the sides of the stairs don’t have railings or screens this CAN happen – and it does (sadly) happen. In addition to these general requirements, there are fire requirements that must be adhered to. These are outlined in Part T of SANS 10400 – Fire Protection, but when it comes to houses, those that are relevant mainly relate to basics (including the materials used to build your home). For instance you don’t have to have fire escapes, exit doors, escape routes, and that kind of thing. As always, the South African National Standards give a good rundown on how we should build to ensure that we “satisfy” the legislation. The most recent Standard was published in April 2011; and it contains new guidelines that relate to both masonry stairways and timber stairways. You will find Part M of the legislation towards the end of Standard, on Page 11. Part S reduces the rise of the step (as indicated in this part), increases the width of stairways and the length of landings. 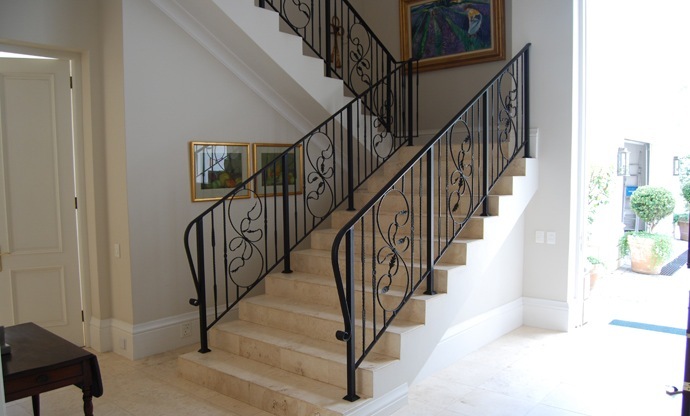 It also has a requirement that solid risers should be used where stairs overlap the next lower tread, and another that specifies the need for handrails on both sides of the stairway. 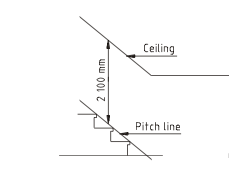 Part T increases the standard width of stairways as indicated in this part, disallows the use of spiral stairways, and requires solid risers for all buildings except those defined in Part A as D4 (a plant room that contains mechanical or electrical services that are necessary for the running of a building, and are usually left unattended). Sometimes the dimensions of risers and going of treads vary in a flight of stairs. This variation should not be more than 6 mm. Further, dimensions of each individual step can be checked for safety by adding the dimension of the going to 2 x the height of the riser. This should be at least 570 mm and no more than 650 mm. Tapered treads and winders (which are are steps that are narrower on one side than the other and used to change direction of the stairs without landings) are most common in spiral stairways. If they don’t form part of a spiral staircase, they must be designed to comply with the minimum tread and riser dimensions shown in the drawing above, and have a minimum going of 125 mm. The angle between successive risers (measured horizontally) must be constant (see drawing below). Stairways that incorporate winders – defined by the SANS as a “tapered tread that has a going of at least 50 mm and which is used in conjunction with non-tapered treads in a single flight” – are permitted in our homes as long as there are no more than three of them, and the winder may not turn through more than 90 degrees. Spiral stairways are defined as a “succession of tapered treads forming a curved stairway which extends as a single flight from one floor or landing to another”. These must be no wider than 800 mm and may not be used as an emergency route. There are also restrictions in terms of certain buildings where they may not be used, including theatres and other entertainment venues, schools, sports facilities, places of worship, exhibition bass, jails, hospitals and health care facilities, offices, hotels, dormitories and hospitality venues. It should be common sense, but people don’t always see it that way, because stairs don’t always LOOK good with railings! If a flight of stairs is more than three risers high, it could be dangerous, especially if toddlers and old people use it. This is why it is essential to have some sort of protection to prevent falling. Other issues include “openings”. If a child can fall through a gap in the railings, or if someone falls and their leg or foot gets stuck in the gap, it could end up really badly. The opening specification is similar to that which relates to swimming pool fencing: it shouldn’t allow anything with more than a 100 mm diameter to pass through it. Handrails are also an important element. If a flight of steps continues for more than about five risers, there should be a handrail of some sort. And any sort of handrail MUST be securely fixed to the wall, screen, railing, balustrade or whatever! In some instances, for example when the stairs are wide (more than 1,1 m), it might be necessary to have a railing on either side. If a screen is made of glass, it is vital that the glass used complies with the relevant SANS. 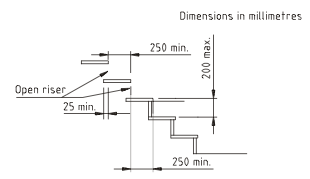 There are several clauses that relate specifically to timber stairs in SANS 10400 Part M (Edition 3, 2011). This section was previously not covered in the “deemed to satisfy” regulations. Stringer beams support treads, and where these are not be wider than 1,2 m in double- and single-storey domestic residences and dwelling houses, they should be at least 48 mm x 225 mm. Grade 5 timber should be used and it should not be excessively warped. If anchors are used and embedded into a Grade 20 concrete (which will be 20 MPa), these anchors must have “a safe working load in sheer of not less than 1,25 kN, certified by the manufacturer”. 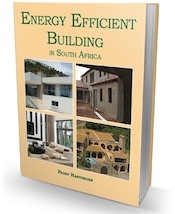 Building Materials and Tests in general are covered in Part A of the National Building Regulations. In terms of timber, it should be treated against termites and wood borer as well as protected against fungal decay in terms of SANS 10005. For consumers, the important thing to look for is the product certification mark of a body that has been certified by the SA National Accreditation System. There are drawings with dimensions for steps in the article above. I don’t have any additional information. Hi, I am a University Of Johannesburg Architecture student. We have been given a project to design a staircase for a two story house. I am thinking of design a half landing staircase with glass balustrades, can you help me with the requirement, what materials can I use for the staircase and type, size & finishing can I use for the glass. Sorry we don’t do assignments for students! Is there a regulation which states “that where a staircase ends on a walkway the staircase should begin or end with a flat tread”. ? How strict can the council be in applying the rule of the 250 mm going if there is is simply not enough space. I have a situation whereby I only can have a going of 240 mm. The building inspector is adamant not to allow it. There must be some exception to the rule in the case of refurbishing existing homes I presume. Don’t presume anything Lukas! But if you are only “refurbishing” why do you need plans? What is the change point in regulation for the use of a stair or a ladder? What does access frequency mean? I have no idea what you are talking about Bert. Houses utilise stairways and not ladders – unless the ladder is portable and used to gain access to a roof space or similar. The term “access frequency” is not used in the regulations, but I assume it means how often an area or space is accessed. What is the requirement regarding rails at steps at a retirement home…? We have stairs outside about three meters plus high…..there is a wall on both sides…but no rails….and the stairs are 2m plus wide. ?? Part T – Fire Protection – of SANS 10400 says that the rise and tread of any step forming part of an escape route must comply with the requirements given in SANS 10400-M – which is the part that covers Stairways. It also says that steps must have solid treads and risers. Part M states that the width of any tread shall not be less than 250 mm. I have just bought into a sectional title complex and the property is on a slope which means that our garden is about 2m above the road. From the garden there is only a very low wall (+/- 500mm) which according to the information above it is not compliant as potentially someone could trip and fall over the wall. Seeing though this is a historical structure does it need to be compliant? Hi Julia, It is very difficult to answer a question like this without seeing the wall itself. Each property has its own unique set of problems and the only one that can give you an answer would be the council building inspector. Please give your local planning office a call and request that they come and inspect. I was wondering…is it a legal requirement to have signs affixed where there is a flight of stairs? Signs in public buildings are covered in the OHS Act, not building regs. There is no need in private buildings.